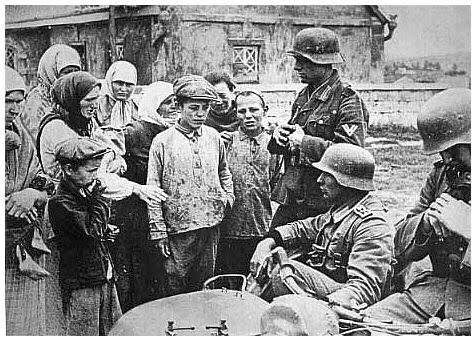 The soldiers of the German army which occupied the Soviet Union (Russia, Ukraine, Georgia) were not blood-sucking monsters. They were human too. The pictures below bring out their human side. 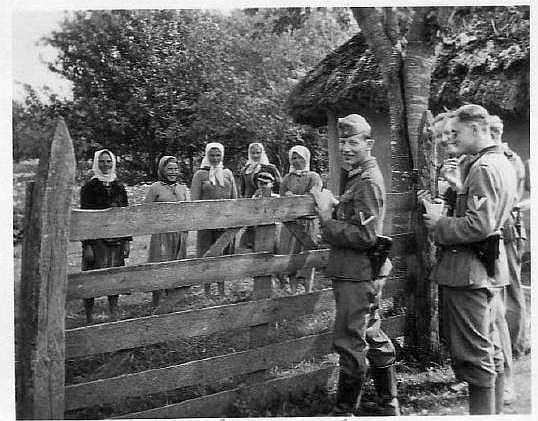 Some of the photos may have been posed for, courtesy Goebbels, but many of them are spontaneous. 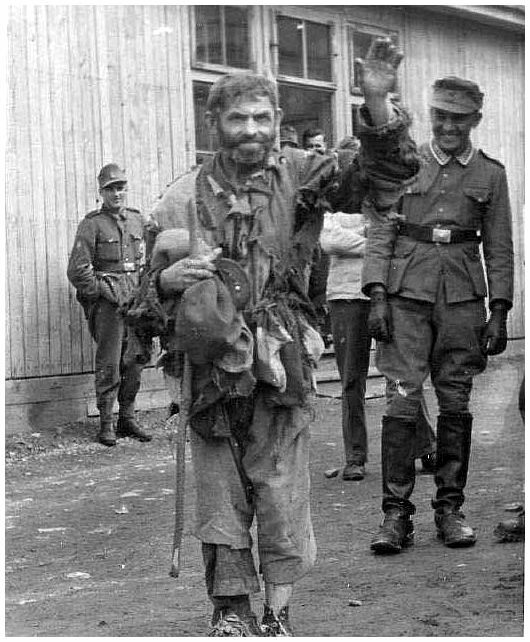 The German soldiers smile at seeing the vagabond. In Ukraine. 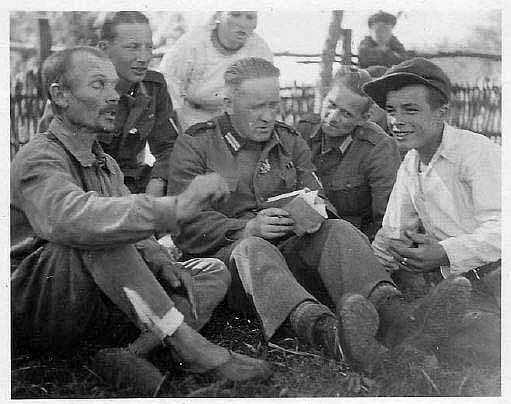 In January 1942, the Nazis published a 60-page booklet titled German Soldiers in the Soviet Union: Letters from the East. It consisted mostly of excerpts from letters from soldiers reporting on conditions they encountered. The letters, of course, were carefully selected, but soldiers had credibility, and the booklet surely had an impact. 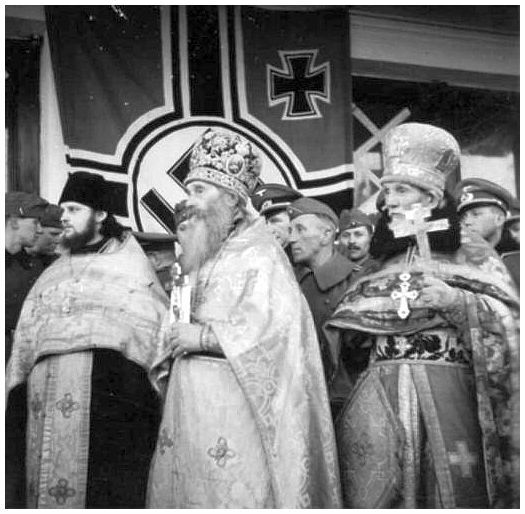 Bolshevist conditions are indescribable. I had never imagined that such misery was possible. People here know nothing about electric lights, radio, newspapers and the like. One can't call what they live in houses. There are only shanties with rotten straw roofs. Huge neglected fields lay around. We haven't yet found even a small shop. This is what people call the Soviet paradise. I wish the few outsiders who still remain in Germany could be shipped here. There is misery wherever one looks. One has to see it to realize how beautiful Germany is. Posing with the elderly. Definitely propaganda. The roads. We in the infantry are probably the best judge of good and bad roads, since we have to march for kilometer after kilometer on them. Here too the Soviets haven't lifted a finger. The main roads are no better than field paths. Believe me, my dear comrades, the soldiers have had many a justifiable curse after marching 40 or 50 kilometers on such a road. Besides, it is 30-35 degrees C. in the shade, and huge clouds of dust make it almost impossible to breathe. Swamps, forests, and bad roads make military action unpleasant, but we keep moving forward. 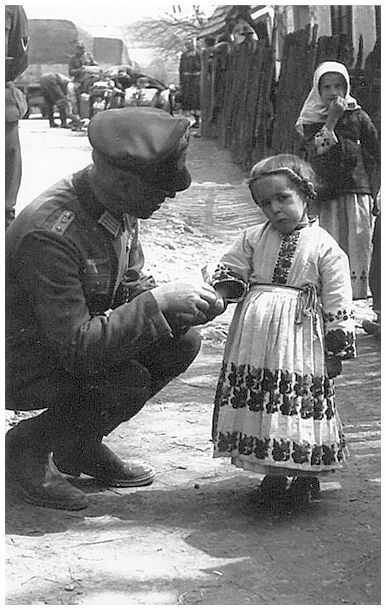 The Wehrmacht officer is all concern for the little girl. Reminded of his daughter perhaps? 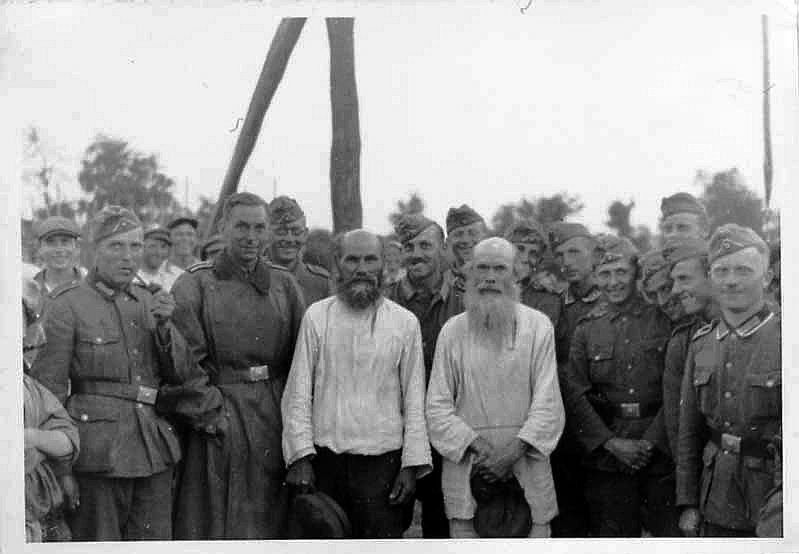 Only a Jew can be a Bolshevist; for these bloodsuckers there is nothing better to be, for there is then nothing to stop them. Wherever one spits there is a Jew, whether in a city or a village. As far as I know (we asked the people, wanting to know the truth) not a single Jew every worked in the workers' paradise. Even the littlest bloodsucker had a post with big privileges. He lived in the best buildings, if one can call them buildings. The real workers lived in small buildings, or better, in animal stalls, just like day laborers in old Russia. It makes no difference whether one is in a village or in a city like Minsk with over 300,000 inhabitants, the stalls are everywhere. Even before the war, most workers knew nothing but hunger, misery and slavery. Some may be interested to know that there were theaters, operas, etc., even big buildings for them, but only those with money got in, and they were the blood suckers and their lackeys. Fixing a date for the night, perhaps? Everything I have seen of the so-called workers' paradise is everything but lovely. One should send every citizen who even slightly criticizes our efforts here. He would thank the Führer and the movement that these conditions are not found in our Fatherland. Animals by us live in better conditions than the people here. Our successes so far have been great, and we will not stop until we have rooted out this evil root and branch, which will be a blessing for European culture and humanity. 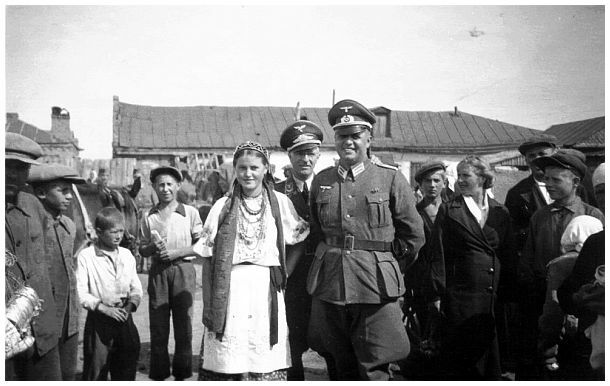 With such a beautiful lady any Wehrmacht officer would gladly pose with. 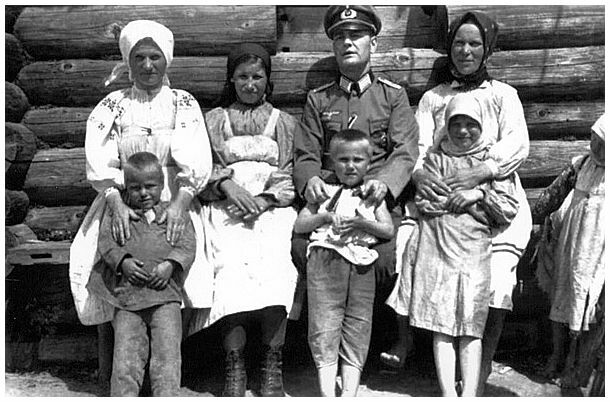 I have seen the "wonderful workers' paradise" in the Soviet Union with all its terrible misery, and wish that those who thought differently could spend a few weeks here to see and experience what we have. 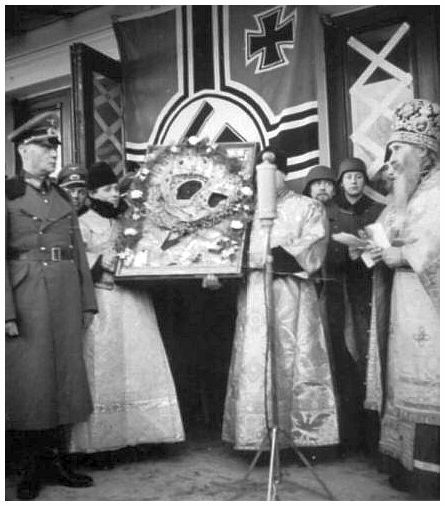 The misery and horror of Bolshevism is terrible. I hope that volunteering for our proud army may atone for my earlier sins, and that when I am back home, you, dear party member, will accept me as an honest person. In that hope, I send you my warmest greetings. 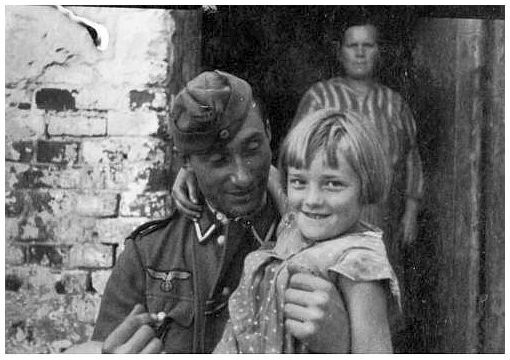 This soldier is playing with the little girl as the mother frowns in the background. I hope he was not a pervert. Anyone who earlier had different opinions of the Soviet Union is quickly cured of them here. The poverty is terrible. Not even the farmers have anything to eat. They beg from us. There are lice and filth everywhere. One has to be careful one doesn't get them from the inhabitants. These people don't know anything else. They sit in their huts and remove lice from each other. They don't mind if anyone watches. I've had my fill of this workers' paradise. We'll be glad to be out of here. In the past we saw pictures of malnourished children. They were not exaggerated. One can't believe it if one hasn't been here. The warriors listen gravely as the local women tell them their problem. This man would make Goebbels proud. 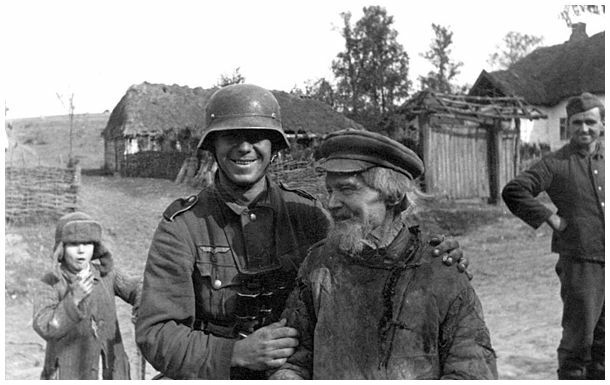 This soldier is all friendly with the locals. Hardly seems like that there is a war going on. He likes the old man. Reminded him of his old man?